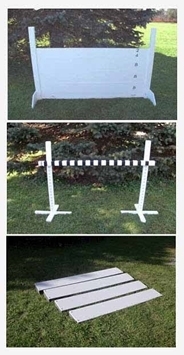 A sturdy set of jumps made out of SOLID PLASTIC (NO WOOD). Weighs about the same as our old wood sets but without the maintenance and care required for wood versions (i.e. NO PAINTING). Assembled with galvanized bolts and screws for a long life with proper care. Jumps are lightweight, easy to handle, assemble and disassemble with wing nuts (NO TOOLS REQUIRED) for easy storage. All surfaces are rounded over to eliminate sharp edges. 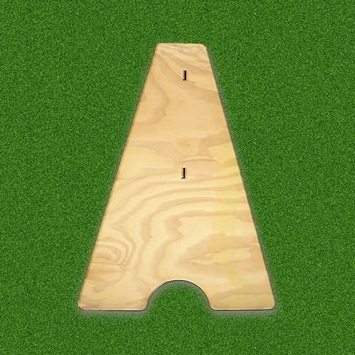 The bottom board of the high jump is bolted to the up-rights and suspended 1" above the ground. This clearance allows for uneven ground surfaces. Additionally, this design allows you to spread the uprights apart, insert the boards and close the uprights for easy setup. Additional 8" boards are available upon request. 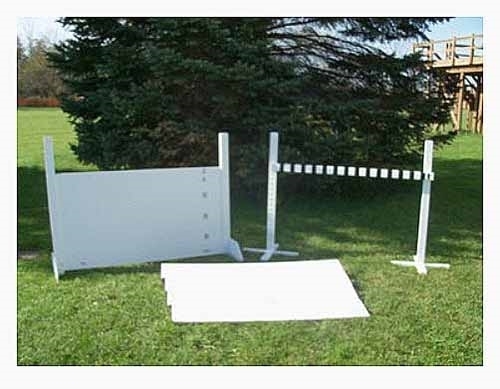 4' Practice sets, (JU44) are designed in accordance with the AKC Obedience specifications. If using this 4' set for Rally a 4" board is available. See Plastic Wood Jump Set Extras. 1 bottom board (4"), 3-8" boards, 1-4" board and 1-2" board to handle any jump height required. The Bar Jump has positions set every 2". The Broad Jump consists of 4 hurdles. 1 bottom board (4"), 3-8" boards, 1-4" board, 1-2" board and 1-1" board to handle any jump height required. The Bar Jump has positions set every 1" and the Broad Jump consists of 4-8" hurdles where the lowest hurdle is 2 sections each 4" wide. • For clubs that use their own equipment for classes, matches and shows, we offer a special set (JU55) that has two high jumps for holding simultaneous open and utility classes.